The most simple to make Yantra, shown in the image acts like a hypnotic aid to make the practitioner totally concentrate upon the end target. The person desiring to perform this Hypnosis Attraction Experiment should prepare such a Yantra on white paper using black ink. Then he should stick the Yantra on a wall and sit down comfortably on a sitting mat, a few feet away from the Yantra. The Yantra should be hung/stuck in such a position [eye-level] that the practitioner can gaze at it in a without tilting his eyes. Then the practitioner should gaze at the Yantra imagining that he or she is gazing a the desired person, if the practitioner so desires he can write down the name of the targeted person below the Yantra. The Tratak should be practiced as long as the practitioner does not feel any kind of discomfort and until his concentration does not waver. 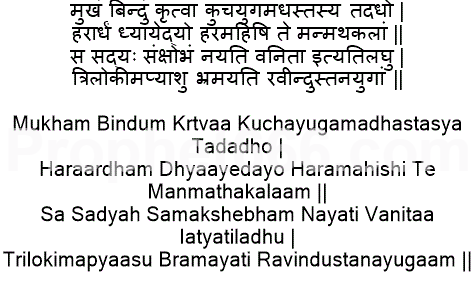 There is also a Hindu Devotional Mantra, which is a verse from the great composition Soundarya Lahari or Waves of Beauty, composed by Adi Shankara, which is associated with this Vashikaran Yantra. The practitioner can keep chanting the Soundarya Lahari -Verse while practicing the Vashikaran Tratak Prayoga, if he so desires. In my opinion the chanting of the Mantra is optional as success in this Tratak Vashikaran Prayog depends largely upon the single-minded ability of the practitioner to focus his entire concentration upon the targeted person. 1) is it a 1 day process? If yes which day? 2) wat shud be the direction to perform this? 3) how much min.tym do we need to do this? 4) morning evening or night or anytime? 5) wat shud be done with the paper afterwards ? The process is really simple, if you follow what is described in the article, success in Tratak depends upon the determination and will power of the practitioner. How do we give command to the target object and get things done when the tratak has lasted for as long as we can, since it is for the control over our target? There is no need to give commands, when the target comes under control he automatically obeys what he is told. Anytime you wish, it is better to start the experiment when the mind is fresh and free from distraction. Is it one time process or we need to do daily? until how long? Hope you can clarify it. Thanks in advance. You an do it daily, until you feel you have gained the desired results. 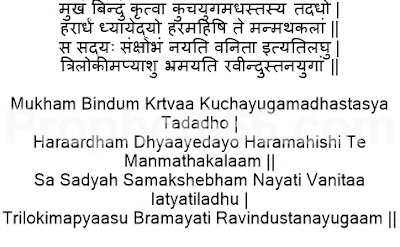 Guruji, can women also chant this one? Yes, there is no bar on women, if they wish to perform this Yantra Experiment.